Page created at 03-11-1999; moved to new URL at 24-05-2002. "A history of the development for the U.S. M-151 jeep"
During the 1950s Ford designed the M151 to replace the M38A1-series Jeeps. It was an advanced design inspired by European off-road vehicles and in effect only looked like its predecessors, as it was technically totally different. It had several improvements such as independent coil spring suspension all round, a unitary body and an overhead valve engine. It was designed to be faster, more comfortable and agile than the M38A1. Several options were tested, such as an aluminium body, revised front suspension etc. In 1960 quantity production of the M151 started at Ford's Highland Park factory in Michigan. The engine was the Ford L142 - a 4-cylinder 2,320 cc. unit delivering 72 bhp. at 4,000 rpm. - but the steel bodies were built by Fruehauf. It was fitted with cast magnesium wheels, identifiable by oval cooling slots. Because of its independent swing-axle type rear suspension, the M151 had the unfortunate tendency to flip over when cornered too aggressively. The rear suspension lay-out (comparable with Volkswagen Beetles) could result in big rear wheel camber changes, causing drastic oversteering and a subsequent roll-over. The M151 was replaced in production by the M151A1 in 1964. Still built by Ford, it had minor changes in the rear suspension including stiffer components, firmer mountings and an extra rubber bump stop to reduce rebound. The basic suspension lay-out (basically an A-frame mounted parallel to the direction of travel) remained unchanged, which still resulted in negative camber when unloaded. Therefore the M151A1 shared most of the undesireable handling characteristics with the M151. The most noticeable difference between the models was the addition of turn signals mounted on the front fenders. Early M151A1s also had the oval-slotted cast magnesium wheels. In 1970 the rear suspension system was drastically changed, and it was taken in production on the M151A2. A trailing arm assembly, with pivots almost perpendicular to the frame rails, allowed the rear wheels to rise and fall with very little change in camber. Although much safer than its predecessors, the lightness of the rear still results in some peculiar handling. The most noticeable cosmetic changes were the large turn signal and blackout lamps mounted in wells in the front mudguards (matching the ones at the rear), one-piece windshield, dished steering wheel with wider spokes (compared to a flat thinly spoked one) on a collapsible steering column and lifting shackles on the rear body corners. The electric in-tank fuel pump was replaced by a mechanical fuel pump. It had windshield washers plus two-speed wipers, and dual brake system. Over the years, production contracts of the M151A2 were awarded to Ford, Kaiser Jeep and the AM General Corporation (of Wayne, Michigan, U.S.A.), while bodies were built both by Fruehauf and Budd . By early 1980 AMG had built 95,000 M151 series. In 1983 it was reported that AMG held the production contract to supply M151A2 series vehicles on a "requirement basis". Variants include the M107 and M108 communications vehicles with radios installed in the rear of the vehicle. The passenger seat faces to the rear to enable the radio operator to work his equipment. The M718 and M718A1 are ambulance versions based on the M151A1 and M151A2 respectively. They have a crew of two, a driver and a medical attendant. This version has a rear overhang and can carry a stretcher and three seated patients, two stretchers and two seated patients or three stretcher patients. 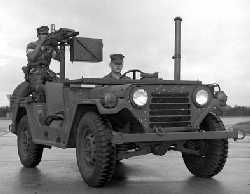 The M151A1C 106-mm Recoilless Rifle Carrier was based on the M151A1 and was assembled by Rock Island Arsenal. It was replaced by the M825 based on the M151A2, which had the M40 106-mm recoilless rifle mounted in the rear. This model was itself replaced by a similar vehicle mounting the Hughes TOW ATGW. A combination of stiffer rear springs at the rear to bear to increased load and a raised centre of gravity affected the already peculiar handling. Normally these weapon carriers are therefore restricted in permissible speed. Various experiments were carried out with the M151-series: a gas-turbine engine was fitted, different tyres (from 9.5/9.0×16 agricultural type to 36×30-14R Goodyear Terra-Tires), flotation kits and bolt-on track elements. The XM384 was a one-off 8×8 vehicle using as many M151 components as possible. It was rebuilt into an amphibious version. To counter the rear axle problem a M151 was fitted with leaf springs and a solid rear axle. Although this set-up essentially solved the handling problems, the reliability of the modified design was insufficient and it also lead to distortion of the frame. Also, an XM29 155mm launcher was fitted to one M151A1C. "INTACT BUT UNSERVICEABLE SOLD TILL 4 FEB 1970"
"INTACT BUT SERVICEABLE SOLD TILL 4 FEB 1973"
"1/2 CUT BEGINS 5 FEB 1973 ENDS 8 APR 1981"
"1/4 CUT BEGINS 9 APR 1981(?) PREFER CRUSH"
"1/4 CUT TO DATE IF CRUSH IS NOT AVAILABLE"
Countries which received their M151s through military aid have to comply with US regulations. Canada also demilitarises its M151A2s when disposing of them. Probably because of the fact that this demilitarisation procedure leaves a lot of components but no bodies, there are a few companies who supply "remanufactured" MUTTs. These companies in fact supply a new body and mostly use the M151A2s drive line and engine. Many options are offered such as 6×6 versions, diesel engines, disk brakes, etc. As far as is known none of these vehicles has been taken into quantity production. Major users of the M151-series are the US Army, Air Force, Marines and Navy. It is claimed that they are also in use by over 100 countries. Argentina, Denmark, Canada, Chile, Greece, Israel, Luxembourg, Mexico, Portugal, Saudi Arabia, Singapore, Venezuela (also M825) and Vietnam are known users, while others are said to include Ecuador (also M825), Indonesia, Peru, Senegal, Singapore, Spain (marines only), Thailand, and Zaire. Denmark replaced its Jeeps (MB/GPW, CJ2A, -3A, 3B) with the Willys M38A1 and Ford M151A1. The first 600 were delivered in 1967. They were used in the Liaison-, Scout car role and armed with TOW. A typical registration number is 36.804. The M151A1 has now been superceded by the Mercedes GD 240. France, when searching for a replacement of more than 8,000 Jeeps (Hotchkiss M210, Willys MB, Ford GPW) in the late 1970s, also tested the M151A2 albeit mainly for comparison purposes. Israel was supplied with a large number of M151-series vehicle by the US. The M151A2s are fitted with roll-over protection. Luxembourg bought the first version of the M151-series. 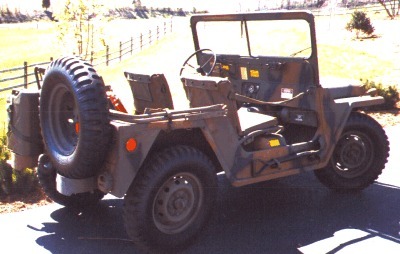 About 80 M151s replaced its Army's wartime Jeeps. Some of them are used for special purposes, for example weapon mounts (including TOW) or radio-equipped. They were in use well into the 1980s when they were replaced by the "Hummer". Mexico reportedly bought Budd's body dies and tooling. Supposedly some bodies and complete vehicles were built there. Singapore used - at least - the M825 recoilless rifle carrier, as in June 1996 approximately half a dozen of these with SAF markings (but without their recoilless rifles) were present in the yard of Staman Trading at Nijverdal, the Netherlands. They had no windscreens and extra brush guards fitted over the headlights and radiator. Of interest was that some examples had markings to warn drivers not to exceed 30 km/h, while other had markings not to exceed 50 km/h! US Forces used all three models, all over the world during war and peace time. It was the principal ¼-tonner during the Vietnam war, for example. Even during the Gulf War the HMMWV (Hummer) had not replaced some special versions of the M151A2, like those used by Rapid Deployment Forces. In service the M151A2 was retrofitted with full roll-over cages called Roll Over Protection System or ROPS. With the USMC, the M151A2 remained in service as a Fast Attack Vehicle (FAV), as it is the only vehicle that fits inside the CH-53E and V22 aircraft. Used by Marine Expeditionary Units, it saw wide service by from Africa (22 MEU, 1996) to Albania and Kosovo (26th MEU(SOC), 1999). The latter unit had fitted their FAVs with a HMMWV turret ring, which adds stability to the weapons as well as better support for recoil compared to the original pintle mount. Of the 112 M151 FAVs in USMC inventory in 2000, 62 are to be replaced by the Interim Fast Attack Vehicle: the Mercedes Benz 290GT long wheelbase truck. But still, six M151A2 FAVs scheduled to deploy with the 15th MEU, were overhauled in January 2000. Operation manual for M151, M151A1. Much information, 123 large pages. TM9-2320-218-10. Change to above, covers M151A2. 28 large pages. CH-218-10. Rebuild and overhaul service. 490 pages. TM9-2320-218-34. Rebuild and overhaul parts. 428 pages. TM9-2320-218-34P. Warmachines No.14 : 1/4 Ton M151 Mutt. Verlinden Productions, Inc., January 1993. ISBN: 1930607067. Softcover, 24pp. Jane's Military Vehicles and Ground Support Equipment 1983. London: Jane's Yearbooks, 1983, p.299-300. Wheels & Tracks magazine, various issues.